Namaste. Together, let us achieve inner peace and a stronger body. Based in Ocean County, Hot Or Not Yoga is a yoga studio offering a beautiful venue for events and classes of all kinds. We believe that the practice of yoga is a moment when you can expand your body and unearth your connection to the higher consciousness. As we become mindful of our practice, together, we allow ourselves to truly connect with our bodies, achieve optimum level of physical and mental health, and eventually, enjoy all the things that life has to offer. That being said, we have a team of passionate and dedicated individuals who can help our students no matter what level, age, or body type. They will support you as you learn and master different techniques and reach new possibilities through the art of yoga. It is our mission to support our students throughout their entire journey in their yoga practice, bringing them place of peace and mindfulness. We envision to become one of the top choices of yoga studios in New Jersey that greatly showcases a harmonious community. Hot Or Not Yoga has indoor and outdoor spaces that accommodate every population. We rent our spaces for events and workshops, as well as private yoga sessions. Each of our studios has its own unique vibe and can hold large groups comfortably. 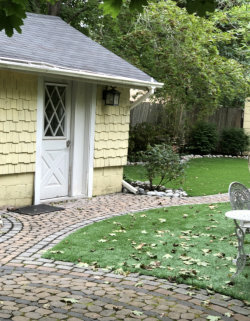 In addition to our main studios, we also house a small private studio in our backyard garden along with our custom built labyrinth. For our students’ convenience, we are also fully equipped with showers and all the amenities, including handicap access. We also offer all organic products in our restrooms and provide towels and other essentials to make a seamless transition from studio to street. As such, we have a versatile space that can be reserved for any special event. 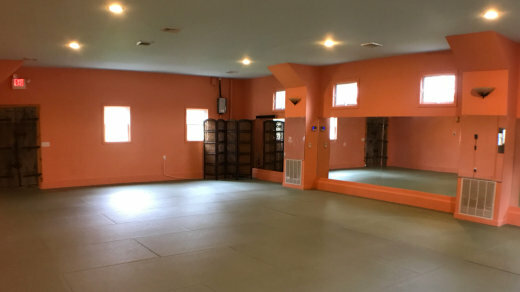 The orange room, or commonly known as our hot studio, has specialized heating for hot yoga with an air purification system and matted floors. Typical temperatures range from 85-105 degrees. With this room, we offer a variety of classes for all levels in different heat settings for everyone to enjoy. After enjoying a hot class, our students are gifted with a much deserved refreshing towel, fragranced with our own essential oil blend. 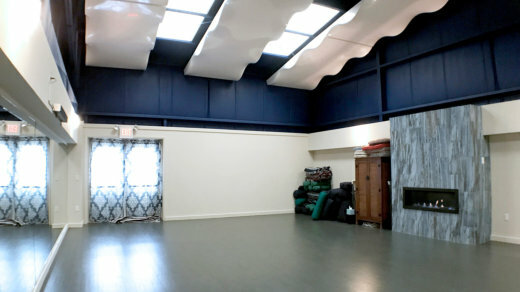 The Aqua Room, or our cool studio, is where most of our classes that are not hot take place. The room is a large open space with beautiful ceilings and soft colors – perfect for meditation, yin, and restorative classes. We have bolsters, cushions, and props available for use in all of our classes. This studio offers a unique feeling from our newly renovated fireplace that adds a whole new calming atmosphere, allowing our students to ease into their class and out of their day. 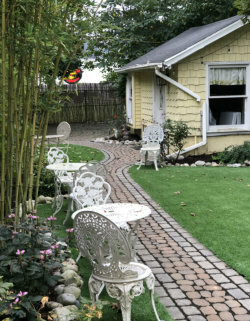 Our backyard garden is where people can relax and enjoy a spot of tea, swing from a tall tree, or meditate their worries away by walking through our custom built labyrinth. Green grass and seasonal plant life add to the beauty of our garden. Weather Permitting – classes may be offered in our Garden as well. Our private studio is nestled in our garden and is a perfect place for small groups or private sessions. It is a great spot to meditate with matted floors and big windows that allow a view of our private oasis garden. We also offer a large parking area and bicycle parking to accommodate all kinds of transportation.